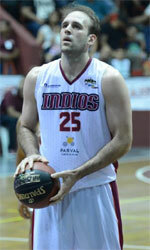 Artik (League A) added to their roster 23-year old American forward Tamas Bruce (202-86kg-95, college: Arkansas State). He used to play at Centro Espanol Plottier in Argentinian La Liga, but left the team in Dec.'18. In 8 La Liga Argentina games he recorded 4.8ppg and 3.6rpg this season. Bruce's team was regular season runner-up in GRAC in 2016. He graduated from Arkansas State in 2018 and it is his first season as a professional player.